My friend Victoria, for reasons unbeknownst and doubtless incomprehensible to me, just listed a fake quote on her Facebook status from Oscar Wilde — she did not pretend it was not fake, only that it was attributable to a fake Oscar Wilde, something of which the really ironic Mr. Wilde would have doubtlessly approved. For some reason — and I think it has to do with my dread of reading T.S. Eliot at this hour, an assignment looming above my head right now — this strikes me as a much more interesting post-modern exercise than the work I really ought to be doing for my Long Poem class at Ole Miss. What if we all just decided what we WISH famous dead authors said and started quoting them with the authority of scholars, as if their fake comments were just as important as what they really said? This is the most wonderful thing I have ever seen! It makes every conversation have a potential punch line of which I am the undisputed expert at repartee! How brilliant I suddenly seem! Oh — I know. Republicans do this all the time with Ronald Reagan. 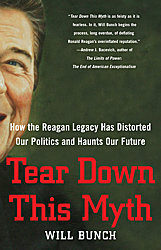 Right now in Washington, the Republicans are having a field day revising the record of Reagan, claiming for reasons that have never been clear to me that his presidency was a golden age in America, when in fact he presided over a stock market crash and a recession, raised taxes, and acted toward women and minorities with the sensitivity of a sledge hammer, showed total indifference to the plight of people suffering from AIDS because it was a disease that preachers around him characterized as a punishment from God on gay men, funded the people who would become the Taliban, Saddam Hussein, and supported apartheid in South Africa, deregulated the banking industry and thereby causing a myriad of problems that haunt us to this very day in our economy — and that’s just off the top of my head. Why make him into a hero he wasn’t? Why make him a genius when he seemed more addled than able? Why make him a champion of any philosophy at all when he can at best be characterized as a spokesmodel for the powerful? I mean the Republicans cannot seriously think that they were elected to shut down the government — nobody in their right mind seriously wants that. If they said everything that they say Ronald Reagan said about spending the way that I just did — with the word “Fake” in front of it, we could all have a good laugh. Sure — Fake Ronald Reagan cut spending. Fake Ronald Reagan championed the common man. Fake Ronald Reagan was a real fundamentalist Christian — he didn’t ever consult an astrologer with his wife Nancy (real Ronald and Nancy Reagan consulted an astrologer for minute details regarding their inauguration arrangements, per the much annotated Kitty Kelly biography, and that should offend any believers in Christianity that would, say, think that astrology is a form of witchcraft — just sayin’). Why not admit, as one does if implying that a fake historical figure has said something, that it is of one’s own invention? Why not say, Republicans, we hate America, or at least its government, and we would feel totally comfortable dismantling the government of the country whose constitution we swore to uphold? That would be honest, and we could all agree that it was funny that your fake Jesus hates the poor and your fake Reagan was a great president. Maybe we can carve both of their heads on a fake Rushmore and call it a night.